SparkFun manufactures their own line of Arduino compatible microcontrollers. 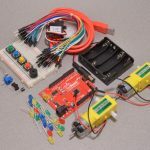 The RedBoard is SparkFun’s version of the popular Arduino Uno and is drop in compatible. 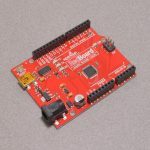 The RedBoard features the same “R3” footprint as the Uno and utilizes the same ATMega328 chipset making it a great alternative. 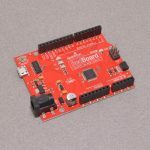 Beyond that, SparkFun also manufactures a few specialty Arduino compatible boards including the Arduino Pro series of lightweight boards, the RedBoard Photon WiFi microcontroller, and the MicroView – complete with built in OLED display.